Anyone here changed the springs on a DDC bike? I know Lawrence has done it, I have read his thread, and we have exchanged PM's. I'm on the heavier side, approx. 105kg/230lbs, and lets just say that dropping to 85kg will probably not happen during the winter break. This means I can't get the SAG within BMW's spec. I had a Local suspension guy set me up with some springs, and I was hoping for better road handling, I don't track the bike so not looking for a track setup. He got in touch with K-tech and I got some 10,5N front and 100N rear spring. These were not labelled for the S1kr, bit for a HP4. the front springs did not fit, too long and too small to fit over the DDC Cartridge. Then the "problem" started, my guy have not been able to get any springs for my bike. My searches online indicate that Wilbers are the only ones that supply fork springs for the DDC. But, I have not found anyone who supply rear springs. Anyone here actually changed the springs on their bikes? and how did the ride change? And anyone know who can supply springs for the DDC suspension? Or am I forced to go on a diet this winter? One has to eat while traveling on vacation, right? Obviously consult a doctor prior. As I am hitting the big 40 next year, losing weight is not as easy as it used to be. I have hardly been under 90kg since I was 18. I did have a few years I was a "gym junkie" back in 2008-09, at which point I was down to 87kg. However, I think that even if I go on a diet and start exercising, I will probably have a hard time to get much under 95kg. I do have a plan to lose weight, but I doubt I will be much under 100kg before the season starts next year, so i think I will go for a slightly stiffer front spring regardless. So how do you cope with a Pillion, seen a few little women (couple not so little) on back of S1000Rs. If you want "soft" suspension try an MT10, then you would not be so unhappy with the suspension springs. I don't think anyone is talking about wanting softer suspension, its about increasing the spring rate (ie. harder) to get the suspension into the right operating range for our weight. I came from an MT-07 :) That thing had crap suspension, pretty much bottomed out every time I touched the brakes. 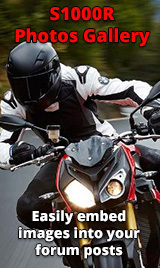 I don't ride with a pillion very often, but you have the "two helmet" option, that significantly stiffens up the rear. I have considered to try and dial back the rear preload and run two helmets all the time. The problem for us "body mass inclined" :) is that the soft springs in the DDC makes the ride harsh. My theory is that the soft spring is allowing the shock to compress too fast and due to the valving is causing them to "hydro lock" and turn rock hard because the flow through the valves is too restricted for the rapid compression of the shock. A harder spring will allow the spring to take up more of the energy, slowing down the compression speed, allowing the oil to flow without hydro locking, and actually make the ride softer. I also think this will improve the feel when pushing through corners. My worry has always been unbalancing the spring rate and the available damping so that the spring motion is no longer adequately controlled. If I remember correctly, this is why Lowrance junked the DDC in favour of a fully customised Ohlins set up in the end. I did put heavier fork springs on my last bike without modifying the damping and it was a vast improvement (at least within my level of ability). This is why I thought I might go up a couple of spring weights using Wilbers next year and see what happens. My understanding of his reason for junking the DDC was because that even with new springs it did not work satisfactory on the track. I dont track the bike, I want a bit more confidence and comfort on the road, something I believe stiffer springs will provide. I'm considering the stiffest Wilbers springs, they are 0.95N/mm (0,91kg/mm) I understand the stock springs are 0,85kg/mm (8.3N/mm). The springs I actually planned to install was 10.5N/mm (1,1kg/mm). I think thicker fork oil will actually make it worse. So stiffen up the springs first, and if that is not responding correctly (too hard), perhaps thinner oil will soften it up. I am no suspension expert, I'm just going by my own (work) experience with hydraulics and fluid dynamics, to try and figure out what is the best cause of action to get a better ride. Its just a pain to get right. The forks are too soft for my weight, making them too soft i.e when braking. because of the fast compression is probably hydro locking its making the ride harsh. Changing to a thinner oil on stock springs should improve the fast compression and reduce the harshness of the ride, but then it will make the softness more prominent, causing more brake dive, greater chance for bottoming out the shocks, and you will probably get a soft bouncy ride with no cornering confidence. Too hard a spring will cause the shock to be too hard, but at least then you have the option to go for a thiner oil.